Mission: The Mississippi River Parkway Commission is a multistate organization which works collectively to preserve, promote and enhance the scenic, historic and recreational resources of the Mississippi River, to foster economic growth in the corridor and to develop the national, scenic and historic parkway known as the Great River Road. Function: The Mississippi River Parkway Commission coordinates efforts to encourage highway improvements, recreational trails, bikeways, scenic overlooks, and historic preservation along the Mississippi River. It coordinates domestic and international marketing, enhances economic development and promotes resource awareness. 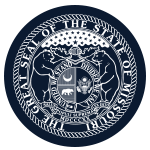 Compensation: Members appointed by the Governor receive reimbursement for realized and necessary expenses as appropriations allow. Geographic Requirements: Yes, all members, other than legislative members, shall reside in counties which are adjacent to the Mississippi River. To the extent practicable, legislative members shall represent counties which are adjacent to the Mississippi River.